As you might guess, Halloween is not officially celebrated in Turkey. But, since we are at an International school full of children and adults from all parts of the Halloween-celebrating world, we couldn't help but throw a few elements of All Hallows Eve into our Friday school day. This is a video of Chris and I walking to work. The children were not allowed to dress up, though some did. 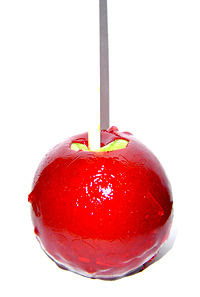 At lunch they received candy apples that they had to all throw away because straight after lunch we have PE and hard candy apples on sharp sticks and physical education do not mix. And that was it for school-sponsered Halloween. But the tricks and treats don't end there. Every Friday BUPS spends the last hour and a half of the day engaging the children in an Activities time. Activities include but are not limited to things such as chess, ice-skating, bowling, clay animation, great books club, cooking, you get the idea. I thought it would be a great idea to do ice-skating since it's something I love to do and it would get me off campus every Friday afternoon. Chris is doing chess because he forgot to turn in his form that listed his preferences. The first Friday of activities, we went to the ice rink but didn't skate. Ice-hockey game was underway so we just sat and watched the game for 20 min. while the children asked all sorts of ice-hockey questions (like, "can they skate outside the red lines?" and "why are they going behind the goal?" and "why are they so mean to each other?") questions I had no answers to. I improvised by telling them they can skate anywhere they want and they go behind the goal to rest. Second Friday of activities, my co-partner in ice-skating Ms. Fatma, got stung by a bee on our way to the buses. I offered to take the kids to the bus whilst she went to the nurse. When I reached the spot where the bus was supposed to be, all I found was a patch of empty concrete. The bus never came and the kids took to swinging on light poles and climbing through holes in the fence. Third Friday of activities, the bus left without me. I was in a professional development meeting all day, and when I got out, the bus was driving away. So yesterday, fourth Friday of activities, we all make it on the bus. Five minutes into the ride I hear a girl in the back screaming bloody murder and I turn around to see blood gushing out of her mouth. Fatma offers to take her back to school after we drop off the other kids to skate. I tell her she is to take Bob back with her as he will not be skating after assaulting his classmate. Bob hears this and immediately breaks down into his own flood of tears and screaming. Now we have one bloody child, two crying childs and 9 other anxiety-filled youngsters on a bus headed to ice-skate. Finally we make it to the skating rink. Fatma returns to school with Bob and bloodyface. At least we're here and we're going to ice-skate. And if you think that's what we did, then I have done a horrible job of foreshadowing. Here's us at the ice rink. Take another look and a listen. Now I know what you're thinking and I'm going to just stop those thoughts right now. "Ah, but kids get a kick out of most anything...they don't care if it's fake ice." I have to remind you, these are not just any kids. These are diplomats kids, ambassadors kids, their parents own TV stations and take them on ski trips to Patagonia. I can assure you, not one child was amused by the plastic ice. If you really want to see them clonking about, here they are. If you listen closely you can hear them complaining about how it's not real ice. Other than that it's an otherwise uneventful video. I bored of the plastic skating and went to find a treat upstairs. These brilliant attempts at translation never fail to evoke a laugh from Chris and I. And this? Well, this is posted where we post videos because I'm just not sure it's for public consumption. Later in the evening there was some trick-or-treating around the lojmans but we weren't around for it. Chris and I, along with our more outgoing colleagues, boarded a bus and went to the pub for a Halloween pub quiz. We lost the quiz, but we won some sanity back. Hope everyone had a jolly Halloween. William Mahoganyboard is a 77-year-old American expatriate who has lived in Ankara for the past 46 years. William is retired now, but he spent the last 30 years or so working for a Russian utility company all across Turkey. I met him at our local grocery store last Tuesday. We got to talking about Ankara and America, and he mentioned how he and his Turkish wife Sansha live in a retirement community in a pretty nice part of the city. I asked him what they did there for fun and William told me about how he writes movie reviews for their community newsletter. Then I asked him if he liked to watch movies and he told me no, but that his wife does and she makes him watch them all the time so he thought he might as well get some use out of it. 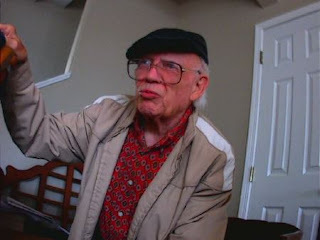 I obtained his permission to reprint his movie reviews on our blog. So please enjoy our very first guest blogger, Mr. William Mahoganyboard. I was very skeptical of this film from the start since it had the word ‘ghost’ in the title. It made me think it would be about a bunch of hooey. Turns out there’s a whole bunch of hijinx AND hooey in it so sometimes you CAN judge a book by its cover I guess. So these bums who are scientists or something are there and then a ghost shows up and eats a bunch of jello and makes a big mess. Then they shot the ghost with some lights and I don’t know, yelled a bunch I guess. Then next thing I know there’s a beautiful lady and she’s growling like a dog and flying up to the CEILING! When I saw that I said, this movie ghostbusters is okay. I really hadn’t seen that anywhere before then. Well then a bunch of stuff happens after that. There is a big cream icing guy. Oh and you guessed it right, they shot him with some more lights and cream went flying everywhere and made a big mess, and I even saw a bunch of the cream fall on the hood of a car in the street and whoever let them do that to their car has got to be crazy cause forget it I wouldn’t let you do it to my car. The end was a whole lot more yelling than before and this big lizard and some other lady who growled like a dog and good grief roll the credits and play the overture already what a bunch of hooey I said! I give this movie the grade ‘okay’ because it was just okay. I think a movie with that flying lady where she flies more and maybe doesn’t growl would be a big hit. Yesterday's package from a Miss Christie Schmidt was by far the bravest package we've seen yet. There are some important lessons to learn from this package that you will see in the videos. Christie, in true Christie form, really added her own bit of comical genius and true thoughtful love. 1. The package opened and soon after we had to stop for uncontrollable laughter (you can write and ask why). 5. Birthday present for Chris? Christie, we can not thank you enough for taking the time and the money and the creativity to send this all the way to Turkey. Way to go on the bravest package of the year. So we've run out of mailbag questions. All of our friends and family have learned everything they wanted to know about Turkey and our lives here, thank you very much. Or maybe a question popped into your head in the shower a few weeks ago but you never wrote it down. Now's your chance! 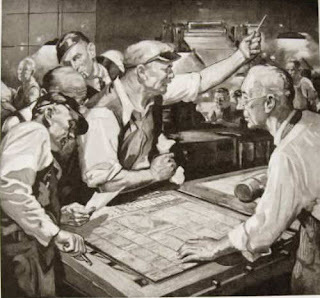 Our operators here at Wednesday Mailbag are standing by, ready to take your comments and emails. Since we have no mailbag question, this post will take a different direction for today. Sarah and I attended the Republic Day celebration at school today. This ceremony is similar to the American Independence Day, but with no fireworks and a lot more singing. Let's start with our morning stroll to campus. This video starts at our front steps and goes to the front door of the school. Gives you an idea of our typical morning commute. This little guy is one of Sarah's second grade kids. His name is Ege, and he is wearing some really futuristic sunglasses today. Actually, most of the kids were dressed up for the holiday. In this next clip, we discover that Chris didn't get the email from the principal telling all the staff to dress up. We also get to watch unsupervised child behavior. Moving left to right we've got Yours Truly from The New World, Paul from the U.K., Sam from Australia and Jason, who is originally from China but grew up in Canada. Paul's a good bloke, Sam's a real mate, and Jason's no hoser, eh? After we rounded up the kids, everybody headed to the school auditorium to kick off the Republic Day presentation. Here's an overview of the room. And here's a quick walking tour of the place that I shot on my way to sit by Miss Sarah's class. What you are about to witness is something that happens every Monday morning and Friday afternoon. The kids line up and sing the Istiklal Marsi (which I'm sure I just misspelled). I would describe it as being similar to our own pledge of allegiance, if I knew what they were singing. The sound guy had the PA speakers at full volume which explains why everyone freaks out for a second when the music starts. For those in our audience who like to know the reasons and meanings behind things, this next clip is for you. Two fifth graders give a very succinct explanation about the reason for Republic Day and some historical perspective. After the ceremony wrapped up, the kids headed back to their homeroom classes where they began the process of electing two memebers of their class as student council representatives for the year. I tagged along and recorded the proceedings. Included next are the two stump speeches from the candidates in Miss Sarah's class who ended up winning, Zeynep and Ege. Next we watch the voting process in action in a short clip I like to call, "democracy looks cuter when little kids are involved." And for the sharp-eyed among you; yes, the ballot box was originally Sarah's birthday parcel from her folks. When I used to visit Sarah's class room back home in Lewisville, I would ask her class for three or four crazy ideas that I could then put together in one wacky drawing on the wipeboard. The kids always loved watching someone create art from their ideas, and I always loved that second grade art standards are incredibly low. I took the opportunity to do this today, and received a very positive reaction. The suggestions they gave me were "girls in an audience," "a stage," and my favorite, "a mailman eating a hotdog man." I think there may have been something lost in translation with that last one. My finished product is below. You can click on it to make it bigger. With the next drawing the kids had figured out that the crazier ideas they came up with, the crazier and more interesting my picture would be. They didn't disappoint with this one. Here's a link to their list of suggestions. You can probably guess my favorite one. After that we had one more quick ceremony which announced the new student council members and then everybody headed home. Our first Republic Day is behind us and tomorrow is a normal school day. We both hope to see many new mailbag questions from you soon! Today is a half-day at work and tomorrow is a half-day at work. Is it correct to hyphenate half-day? I could ask the modern-day-oracle-at-delphi-known-as-Google, but obviously I enjoy hyphenating words too much to find out. Do two half-days equal one full day, or no day at all? I suppose it depends on your point of view. I guess I'm in the “work smarter, not harder” camp, so I judge two half-days as a nice break. But depending on your industry, two half-days might be more of a curse than blessing. Salespeople, waitstaff, and tattoo artists probably don't like half-days. It's better for them to just take the whole day off rather than to cope with half the number of walk-in customers, half the tips (and no dinner crowd) and half-finished body art. Actually, I guess tattoos could wait a bit. You'd just have to deal with the looks you got when you showed up at the gym with a decapitated mermaid on your forearm. I think there's a very good chance I'll go home at noon today and keep working. I am snowed under in thick drifts of paperwork at the moment, and though I cherish the moments of the day when I'm not hovering over a sheet with my eyes slowly crossing, I like to do the work I'm doing. My principal has tasked my teaching partner and me with creating the technology curriculum for first through fifth grade. This is a huge undertaking. On top of that, I've got my first midterm due next Monday (a take home test). Plus, I'm trying to develop a computer certification program for each grade which will work like a martial arts belt test but with computers. Plus, the administration decided to change all campus computers over (about 230 of them) from Linux to Windows and the IT Committee (which I am a member of) has been tasked with making this happen from purchase to implementation. If I didn't deeply dig all this stuff I would go home, catch up on several episodes of Heroes, and take a nap before grad school tonight. But deeply dig it I do. Well okay, maybe a nap. I just sent my absentee vote for the US Presidential election from your post office today. With a delivery confirmation so I know it got there. And now I'm BLOGGING about it! Why would anyone in Turkey have a problem with the following post? This week we had a visitor over to our house. He spent most of his time in our bathroom. It's okay, we spend a lot of time in our bathroom as well, but we got to a point where we decided this dude needed to go find another home. He was not, however, eager to leave. So we gave him some space, and soon enough, the crisis was averted. For the past three days anytime Chris and I try to get on Blogger to create a post we get a message saying the server has timed out. We tried the computers at school, nada. We tried changing our settings at home, nada. Saturday we finally started googling "blogger outage" to see what the news reports said. It is suspected that the reason for this has something to do with Adnan Oktar, by some considered the leading Muslim advocate for creationism, who has in the past managed to get Wordpress, Google Groups, as well as Richard Dawkins’ website banned. Turkey’s EU ambitions seem paradoxical to the infringement on the freedom of press and speech of its citizens, residents and visitors by banning sites like this. This is not China. This has to stopped. Good thing the EU’s making a blacklist of censoring countries and are creating software for people in censoring countries to use to overcome the censorship (Global Online Freedom Act)." In April 2007, Oktar filed a libel lawsuit against the owners of ek$i sözlük, a virtual community similar to everything2. The court reviewed the complaint and ordered the service provider to close the site to public access. The site was temporarily suspended so the entry on Oktar could be expunged and locked. Access to another news Web site was also restricted following Oktar's complaint. In August of the same year, Oktar was able to get a Turkish court to block internet access to WordPress.com to all of Turkey. His lawyers argued that blogs on WordPress.com contained libelous material on Oktar and his colleague which WordPress.com staff was unwilling to remove. On April 10, 2008, Google Groups was blocked in Turkey following a libel complaint by Adnan Oktar. As of May 5, 2008, the ban remains in effect for TTNet users. On September 19, 2008, a Turkish court banned Internet users in Turkey from viewing the official Richard Dawkins Web site after Oktar claimed its contents were defamatory, blasphemous and insulting religion, arguing that his personality was violated by this site. In response, Dawkins posted a Turkish translation of his "Venomous Snakes, Slippery Eels and Harun Yahya" article ("Zehirli Yilanlar, Kaygan Yilanbaliklari ve Harun Yahya") on his website. Then one week later a complaint by Oktar led to the banning of the internet site of the Union of Education and Scientific Workers (Türk Eğitim Sen). This was followed by a block of the country's third-biggest newspaper site, Vatan, in October." One man, one rat, can ban entire websites and communication forums throughout an entire democratic country? How does this country think it is going to become a member of the EU when it allows gross violations of free speech like this? What's even more unbelievable is that four minutes after reading this Chris and I turned on our hotspot shield (Hotspot Shield creates a sort of secret tunnel so it's not clear where you are trying to get internet access from, for example, I think right now the Internet company thinks I'm in San Diego) and voila, we're on Blogger. Anyone with even a slight interest in getting around the Turkish ban could do so within four minutes. So what's the point? Essentially, this guy Oktar is a radical Islamic propogandist whose "revolutionary literature" all center around his really original idea that everything in the Old Testament is perfectly accurate down to the tiniest detail, and therefore all these dinosaur bones we keep finding are a hoax and the theory of evolution is just a fairy tale that Western scientists cooked up. Probably just to hurt his feelings. "In September 2008 Oktar issued a challenge offering '10 trillion Turkish lira to anyone who produces a single intermediate-form fossil demonstrating evolution'. Biologist PZ Myers responded: 'The US government should immediately send a plane to pick up Mr Oktar, bring him to our country, and take him on a guided tour of the Smithsonian and the American Museum of Natural History, accompanied by Niles Eldredge, Kevin Padian, Jerry Coyne, Sean Carroll, and the entire scientific staff of those museums. Oktar's offer is similar to creationist Kent Hovind's $250,000 offer, which has been dismissed by creationists and scientists as a misleading gimmick where those who applied for the challenge have questioned his sincerity about paying and understanding of evolution." I'm going to be real honest with you here for a minute (mom and dad cover your eyes). Chris and I bathe in tea-colored water. My doctor, he told me to "eat all the vegetables" for a sore throat I was having. The other night, Chris and I had to listen to gunshots fire off at random intervals for about 2 hours. I'm not sure I feel safe here anymore. There are a whole lot of problems with America. But this level of censorship isn't one of them. That an entire country's blogosphere could be shut down because one wealthy man could afford to hire as many unethical lawyers as he wants to is not only a disgusting breach of public trust, it's also evidence of fundamental flaws in governance. It's still not clear why all of Blogger was shut down over a few blogs one guy didn't like. Why not just block those few offending blogs (which would still have been wrong, but less so)? The government's response is like dropping nukes to prevent the flu. Look, we have flu shots! You could just block the sites that he's brought charges against! To an American, it's difficult to understand how something like this could happen in a country that claims to be democratic. If I was living in Saudi Arabia, or China I would just be happy to have internet access at all. But I don't live in those places, and Turkey loudly proclaims to anyone who will listen that they are different. And then they drop a deuce in their pants. And we stand there nodding politely, listening hopefully to Turkey's democratic aspirations, smelling the sad truth all the while. Why can't Turkey just potty train itself already? Nobody will take this country seriously as a member of the global community until it stops messing its trousers. Listen, we don't care how many UN guidelines you adhere to or how open to trade you are. If you can't walk into the EU staff meeting without smelling like excrement, nothing you say is going to matter. The whole time your colleagues are going to be sitting there asking themselves 'who let the hobo in' and the awesome speech you spent all that time preparing is going to fall flat. Not pooping yourself is considered a basic skill. How could anyone ever trust you with more important matters if you can't relieve yourself without an instruction manual? Maybe you need a refresher. Your job is to allow free and unfettered access to whatever communication your country's little heart desires. If they want to build big metal poles to climb up every day so they can shout across the rooftops at each other, you help them do it. There's nothing else to think about. Let them talk. Ah ah ah! Don't say "but, but..." There is no 'but.' You're making it too complicated. Here's what you do: you just let them talk about whatever, however, whenever. Got it? Are you sure? Okay. Go. And you crapped yourself immediately. Sarah and I have a hard time swallowing this precisely because we really like this country and its people. We see how open and accepting they can be. We see the same potential that everybody keeps talking about. It's exciting to think of Turkey as a beacon of real freedom in a region so stifled by religious suppression and ignorant policy. This place actually has a lot to offer this region and the world at large both from a historical perspective and as a working model of a thriving melting-pot of cultures. After this week, unfortunately, we have seen evidence that Turkey's potential will not soon be realized. And it's kind of a bummer. Oh well, at least the Turkish version of the FCC was extremely incompetent in their attempt to block Blogger. Stay tuned for more posts from Turkey, the land of fake democracy. I was thinking about you last night b/c these past two weeks have been premiere week for TV shows...what kind of TV shows do you get over there? Also, what do people in Turkey think about Americans...about the presidential election, etc...is it on their radar screens at all???? Chris here. I get to be the straight man and Sarah gets to goof on my answer this time. Division of labor. The few times I have spoken with the Turks about their views on the election I have noticed that the only opinion I have consistently heard voiced is that no matter who wins, it will be good that Bush is gone. The Bush administration did a lot during its tenure to sour people on their idea of what America is all about. But the Turks I mix with (teachers) seem to be intelligent enough to realize that the Bush administration doesn't reflect the values or the principles of all Americans, and thus I don't sense much of a negative or positive stereotype from the Turks. But the Canadians? They hate us. They do their best to be polite and they're civil to us and everything, but every chance they get they're making fun of our credit cards ("What? You're paying with cash? I didn't think Americans had any cash left! "), they're making fun of our food ("How have you guys made it this long without a Big Mac? "), or they're insulting our sedentary lifestyle ("You walked to work today? I'll bet you're the only two Americans on the planet that did! "), etcetera, etcetera, etcetera. There is one stereotype that the Turks love to flaunt at us, but I wouldn't necessarily call it a negative one, more a hilariously inaccurate one. Turks love it when we tell them we come from Texas. As soon as they hear that, they make their finger into a gun and say 'bang bang' at us, or ask us about our horses or our boots. And some of them think of Texas the way we think of Iraq: as a dangerous place to be. A couple of Turks (including one very vocal cab driver) have voiced their disbelief to me at the large number of executions which happen in the Texas justice system. To them, since the people being killed are mostly non-white, and they are non-white, Texas seems like a dangerous place. Definitely an eye-opening perspective. And as for TV, we don't own one. But we have figured out how to watch any TV show whenever we want through the magic of the information superhighway. We're both really thankful that Al Gore invented it for us. Going second is really hard. I'm so tempted to talk about how Chris is a nag and how I will from now on refer to him as Coat Hook (capital C, capital H) in an attempt to avoid any confusion. But seriously, let's talk about the Canadians. They do make fun of us, in front of us, with very little empathy. They wake at 5am and go running, eat carrots dipped in vitamins and have perfect teeth. I'm curious what the Turks think of them. I think the Turks find a lot more similarities between themselves and Americans than they find between themselves and the Canadians. As noted in another mailbag, Turks like food - Americans like food. Turks like honking their horns- Americans like honking their horns. Turks like sugary foods - Americans love sugary foods. Canadians wouldn't consider eating half of the stuff in a Turkish grocery store, they don't have horns on their cars, rather if they need to tell someone to go because the light has changed colors they simply get out of their car, knock on the offending car's window, politely ask the car to move and then invite the driver to dinner to make up for interrupting their day. And Canadians will only eat sugar if they are eating it while running on a treadmill and simultaneously having a tooth cleaning. The Turks absolutely know about the American election. Today in Chris's class I watched him ask a class of Turkish fourth-graders,"Who is running for President in the USA" and the kids all shot up their hands with correct answers. TV? We have no Turkey TV but we hear we're not missing much. Eventually we'll stay at a hotel that has TV and we'll report back to you. For now we watch all the same shows you do, but for free and without commercials. It's a nice little life Coat Hook and I have made for ourselves. We hope you all can come over soon and experience it for yourself. Today was a huge birthday success. Chris used the word belated, but I disagree. The Turkish mail system was the sole cause of any of these packages arriving past their sender's desired date, therefore, they are all on time and simply Part III of the 30th Birthday Celebration. The first package I opened was from my parents. They were frustrated the package didn't arrive sooner, and I understand their frustration...check out all the goods!! It's either a great example of how well my friends and family know me, or a testament to how assertive I make my "likes" known. I can't believe how amazingly well you all know me. I am bathing in jelly bean, cheeto, ziplock bag heaven. Thanks again for making this one of the best birthdays I've ever had. From now on when I post I will call my wife Sarah by the name Picnic Table, with a capital 'p' and 't,' in an attempt to prevent confusion. Some of you may remember that Picnic Table wrote a post not long ago concerning a "Turkish Dollar Store" we found. We were both overjoyed to once again pay cheap prices for poor-quality Chinese household products, as opposed to the exorbitant prices we'd been paying for the same items up until then. We are already due for another trip back. What I'd like to focus your attention on today is one of the several chintzy items we took home from the store. Let's start with a couple photos of the product. These are assorted, fruit themed, multi-colored, vaguely extraterrestrial, sure to snap at any moment food clips. You don't actually clip food with a food clip, you clip shut the bag that the food lives in. Calling these things Food Bag Clips , or Food Container Clips, or Food Home Friction Enclosures just wears me out. So they're food clips. Anyway, you get the idea. They're tacky, suburban, mostly unremarkable little doodads. This is probably the most that anyone has ever written about the little buggers. Picnic Table and I bought them because we like to be proactive in the fight against stale potato chips. And that's the most anyone ever will write about them. Because now I need to turn your attention to the star of this post, the bag the clips came in. Well, really just the label at the top of the bag. The bag was unremarkable; just another clear cellophane bag the perfect size to choke an innocently-grazing dolphin to death. What I'm here to show and tell you about is the cardboard label at the top of the package. It's a 3" by 6" piece of cardboard with a little hole in the shape of the Sesame Street logo so that you can hang the whole package on a hook in your Turkish dollar store in the sightline of a cheap American browser like me. It's the type of image your eyes might glaze over without another thought. But click on the picture and take a closer look. The first thing you'll notice is the 'name' of the product, Yu Feng. It's impossible to avoid seeing this since it's scrawled in putrid rainbow letters right in the center of the label. This begs the question, is 'Yu Feng' Mandarin for 'food clips?' I doubt it, since the YF in the top-left corner looks like a company logo. But if the name of the company is Yu Feng, then why have they bothered to brand this product twice with the name of the manufacturer and never made mention of what the package actually contains? Or, alternatively, if 'Yu Feng' does translate as 'food clips,' then the name of the food clip manufacturer is Food Clips? Or the YF logo actually doesn't stand for Yu Feng, but instead stands for two totally unrelated Mandarin words? This is only the beginning of the questions, and they don't get any easier. Read the description of the product line, printed in blinding magenta script below Yu Feng: "Advanced Family Articles For Use Series." I read this sentence several times until I finally just had to stop. My eyes were tearing up too badly to see through the searing heat of the magenta letters and my state had deteriorated from mild confusion to physical shock. My God, the implications. Does that mean that this manufacturer creates whole lines of products (or families) whose sole purpose are to to be utterly devoid of all 'Use,' along with their more conventional 'For Use' products (or families)? What could those products be?! Food clips constructed of antimatter? Wouldn't even those have some use to someone or something somewhere, wouldn't anything? Or maybe this is their series of products (or families) which are designed and marketed for use, whereas before they only specialized in non-useful versions of the same products. Like maybe food clips without the metal spring part, just the plastic fruit decorations in a bag? But how could that product exist anywhere in reality as we understand it?! I finally began to understand the truth when my fevered brain perceived the tiny man in the corner. He wears a blue hat over his short-cropped black hair and green ponytails. His puke-rainbow-colored kilt is hitched up by bright blue suspenders attached to a medieval belt, each clothing accessory rendering the other useless. His right arm is blue and the rest of his skin is fish-belly white, the flesh of a corpse in winter. In his left hand he grips what looks for one moment like a net, and for the next moment like a tennis racket in upward motion, and for the next moment like a portal to a gauzy alternate dimension. He appears to dance awkwardly in an infinite field of immaculate grass and fog. As he dances, holding his incomprehensible device, he is framed by two monstrous butterflies in flight, each of which is as large as a frying pan and whose coloring cannot be processed by human vision. Behind him creeps some hideously maimed red insect as large as a toaster and with one gaping hole for a face. The little man smiles robotically up at the sun in the far distance. The sun smiles back in satisfied benevolence, as it ignites in supernova and tears this doomed world to bits with streaking rays of deadly heat and radiation. The plastic flowers at his feet have already begun to melt in this final dawn. This lone survivor of a dying world faces his utter annihilation with a serenity so foreign to our understanding of life, that we can only conclude that he has never known existence in terms we could ever understand. Or we watch an insane man burn. Or it could be a happy picture of a child catching butterflies on a summer day, but I think that explanation only confuses the matter further. I've only recently recovered my senses enough to begin to unravel what this packing label might be telling us. What seems most likely to me is that this product was never supposed to be "here" at all. My guess is that if I tried to locate a housewares manufacturer in China called 'Yu Feng,' I would find that no such company exists or ever has existed before. This package and these food clips are from another place or another time. My hunch is that it comes from the future timeline of an offshoot alternate reality to our own. How it got here is an entirely different discourse, and your guess is as good as mine. I look at that man and that sun, and my gut tells me that it'll be the best thing for both of us if we never find out the answer. PS - Picnic Table is sick tonight. She is laid up in bed with the Turkey Tummy. Or was it the Chilli-Cheese Dog Pasta I cooked last night? Another question for which we would be best off without an answer. Anyway, she wanted me to tell you that she'll post her Bday Part III when she's feeling better tomorrow. Our first stop was the beautiful spa pool. 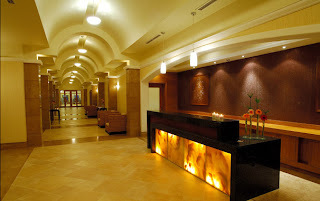 We lazed about the pool until our massage therapists came to fetch us for a wonderful hour long sweetheart massage. 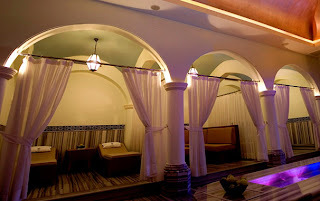 After our massages we went to the relaxation room where all you could hear was water falling and soothing music. 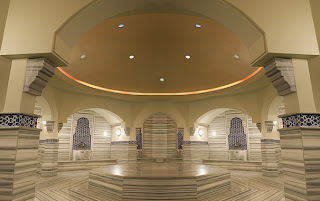 In reality, two Turks were babbling so loud I had to ask a spa worker to sshhh them. Only to be replaced 10 minutes later with two even louder Turks. We opted out of the Hamam room because as far as we could tell to get in you had to get completely naked and let a Turk soap you down. After cleaning up and preparing ourselves to re-enter the real world of car horns and pushy people, we cruised on over to my birthday restaurant choice, Tapa Tapas. A spanish restaurant with all my favorites. We spent some of the night watching this dress spin around in the window display across the street. "Look at that shiny gold dress honey...I must have it!" "Why don't we just buy some spray paint and spray down some dresses you already have?" "What a great idea! Oh honey, you're the best." 30 Part II, in the bank. This Friday, October 17th, I turned 30 years old. I like to celebrate with my friends and family, and was actually quite bummed that I wasn't going to be able to do so this year. As it turned out, I felt surrounded by love and celebration all day long. I can't thank everyone enough for making it one of the best birthdays I've ever had. It started with flowers from my incredibly resourceful husband who figured out how to send me gerber daisies in Turkey. I then made my way to what I thought was a second grade meeting, but ended up being a surprise 30th birthday party. We then went home where I dove into cards and packages and emails. The first package I opened was from my cousin Angela and her family. After finding some tools and changing out the camera battery, I finally made it into the package. My sisters package was next. I was sure this box was going to make me laugh and it did not disappoint. Words could not do the opening of this package justice, so thankfully we have video. But then, the Spooky CD took spooky to a new level with the spookiest spooky track you've ever heard. The next piece of real mail came from my wonderful Nana. Along with flowers, Chris also managed to find a birthday card in English. I read the card, cried, then opened my present. The rest of the night we spent Skyping with sisters and parents and opening more cards. Ordered pizza and ate leftover homemade chocolate birthday cake. I mentioned I love birthdays. My birthdays usually come in three celebratory parts, so look for parts II and III to be posted soon. Thanks again to everyone for making my big 3-0 so special. The school where Sarah and I work is very committed to providing professional development for its staff. Today I found out that I will be attending an Information & Communication Technologies conference sponsored by the International Baccalaureate Program. My school is putting my teaching partner and me on a plane bound for Vienna, lodging us in a bed and breakfast for two days, and paying our salaries while we miss work to do it. Sarah is doing her best to be happy for me, considering that I will be spending Valentines day in Vienna without her. It's a good thing we replaced Valentine's day with Malentine's day a long time ago. This is going to be a fantastic opportunity to broaden my professional skills, and I've never been to Vienna before. Good news comes in threes, right? We'll be sure to let you know when the other two pop up. PS - REMINDER!!! Sarah's b-day is THIS Friday, the 17th!!!! How much extreme punctuation will it take for you to remember to contact her on her big day? Three question marks??? FIVE question marks????? FIFTEEN QUESTION MARKS rendered meaningless by THREE EXCLAMATION POINTS???????????????!!! Unfortunately today's post has to be short and sweet. The internet has been off most all of the weekend so we have to take these little windows when it is on and get the blog posted as quick as possible. So here's our weekend in quick-time review. We finally, finally found the Turkish Dollar Store. It's not all a dollar, but it's close enough. Cheap Chinese products for cheap chinese-like prices. We got tongs, a keychain calculator, hangers, Chris got some tools, I got a sewing kit, it was great. Then we found a Playgame Station. Basically a coffee shop with couches and Playstation 3's to play. We enjoyed a fall walk around our favorite new part of town, then headed back home. Today, Sunday, we did home chores. Laundry, kitchen and bathroom cleaning and tried to find other things to do that we didn't need the internet for. It's rare that Chris and I get to type about what we're actually doing, right now, as you read this. Real-time blogging if you will. Blogging for Total Geeks 101. 1. Having a heated debate over the educational value of constructivism-based curriculums versus rote memorization. 2. Watching BBC videos about pumpkins carved into boats. 3. Typing words like "endoplasmic reticulum" and "zooflagellate" into the online dictionary and listening to an American and a Brit pronounce them. If you guessed all three, not only are you right, but you probably also figured out that we got tired of scientific terms and after about 6 minutes had moved on to "fart" and "fanny." But we're laughing harder than we've laughed all week, and learning in the process. You can judge us if you like. We judge ourselves a little. I'm going to be 30 in a week, I am a graduate student and a professional, married woman and I just laughed till I cried when Chris found a way to make the computer do a French accent and say "poo poo." Maybe there's only so much "adult" you can pack into one week before you just run out. We woke at 5am today to do a yoga class, so suffice it to say, I am out of adult for now. I've been wanting to post about this since before we left for Turkey. The reason that I waited so long is cause I didn't want to get anybody in trouble, especially the nice guy who is the main character in the videos I am about to show you. See, I had a problem with my Macbook Pro. The details of the problem are unimportant. All you need to know is that my internal microphone was messing up, and I took the computer into the local Apple store to get it fixed. My computer got fixed and has been working fine ever since. So I have to assume that in most respects, the guy who fixed it is a responsible, capable person. Except that he made one pretty bad mistake that I didn't notice until I was driving home with the computer in the seat next to me. I powered it on to make sure that it was working before I got too far from the store. And I immediately noticed that there were several video files on my desktop that weren't there before. I clicked on the first file and the video that began to play was from the perspective of my computer's onboard camera as it was being carried into the back of the Apple store and placed on a workbench. It was then I realized what these files were: video footage that my computer captured while it was worked on in the back room. I checked the file lengths and figured out that this poor guy had accidentally left over 45 minutes of undeleted video right on my desktop. I got home and Sarah and I immediately watched all of them. There's nothing too shocking or incriminating on the videos, but there's definitely enough cursing, talking trash about specific Apple store customers and (even) talking trash about Apple products for most of these employees appearing in the videos to probably lose their jobs. And I'm not interested in that. They fixed my computer after all. This poor guy's only crime was forgetting to delete the videos that he made. Regardless, I feel like enough time has passed that posting a few of these videos won't do any harm. I'm not going to post the ones with especially large file sizes or especially harsh language. I'll show you those when I get home for xmas! I loved this post! And the underwear aisle pic cracked me up. I booked my plane ticket to Greece/ Turkey. I will be be in Turkey next year. Here's a second question for your mailbag: If you had to characterize the Turkish people in five adjectives, what words would you choose and why? First of all, so happy to hear you will be visiting this fine region soon. Our tiny door is always open. Your question is an interesting one. Firstly, it begs the question, how many Turkish people do I think read this blog? Assuming it's even one, we'll have to go for the sanitized answer. There's just certain things that I think a Turkish colleague would probably take offense to reading. They have very firm feelings about their country and the historical figures that have helped build it. Trying to challenge any of the beliefs or doctrines (or football teams) is not taken lightly. After my trip to the health center yesterday, I would say any surviving, thriving Turk would have to be quite resilient. Hardy. Fit. This was the sink in the doctor's office. Oh, and after taking a swab from my throat, the Dr. wiped it on a microscope slide, wrapped the slide in paper from his desk, then told me to take the slide to Ankara (isn't that where I am?) and ask them to run some tests on it. Turks also have that warm, welcoming attitude I've found to be so common in warm-weather regions. Turkey is entering a very new place in its life. It's home to some of the world's oldest civilizations, but is still struggling with a very new democracy. Turks haven't decided yet where they should head and most are shy to take leadership roles for fear of failure. Turks are very proud of where they come from and who they are. Countless red Turkish flags coat the city. It's like one day there was a brigade of 200 Turkish hot air balloons, and they all popped and fell to drape the buildings, streets, parks, walls, bathrooms. Ataturk, the country's most revered leader, is pictured everywhere. His bust is everywhere. I'm pretty sure there is a factory in Ankara solely dedicated to making Ataturk busts. His masoleum is here in Ankara and every Turk is suppose to try and visit it as least once in their life to pay their respects. The Turks stand by their heritage. I'm eager to see how that list of adjectives changes during our time here. Wonder what 5 adjectives the Turks would use to describe us? This is Chris and I am also looking forward to your visit. And thanks for your question. I will now invent five adjectives which describe Turkish people. It's like boisterous and like gregarious, but frumpier. Their boistrous gregariousness is tempered by a frumpy edge. I don't know how to make this any clearer for you. Anytime a Turk has food in their hand they offer it to you. Then when you politely decline, they lean in close and offer it you again. Extremely generous about food to the point of discomfort. Every time I go to the hardware store, there are at least three couples of middle-aged men walking arm-in-arm through the store shopping. The women couples are even more numerous. But these aren't couples. They're family members, friends, or even just co-workers. This is how people walk together in Turkey, with their hands all over each other. Prepare to be touched early, often and in public. When driving a Turk will honk his horn no less than three times during the trip, regardless of distance traveled, time elapsed or lack of legitimate cause. States would only be served in a hummingbird feeder. I tried to eat it once but I couldn't finish, because I immediately developed diabetes and lost consciousness. Have a great hump day and keep the questions coming!! This Saturday night Chris surprised me with a date to Atakule Tower here in Ankara. 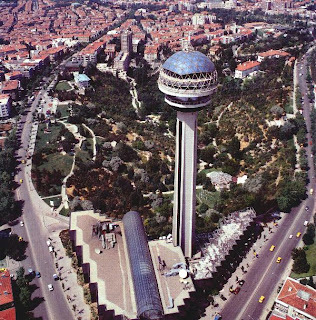 The tower has a beautiful 360 degree view of Ankara, as well as a rotating restaurant on top where we dined on fine wine and steaks. As the tower is 125m high (44 floors), it can be spotted from most anywhere in the city. We've used it as a landmark several times when lost. It was a great way to bid adieu to our holiday week. This post is a short one as today is the first day in 8 days that we've had to wake to an alarm clock. We do our homework now and go to bed. After coming home today Chris told me I smelled earthy. Yeah, probably so since I was lying in the Earth reading for about half an hour. An attack of ants cut my reading and cloud-watching short. I left the park only to get lost in some deserted backwoods. Every "path" ended up being a dead end. I could see our house over the hill, but I couldn't find a way to get to it. But as it is in life, if you just keep walking, eventually you'll find a way out. 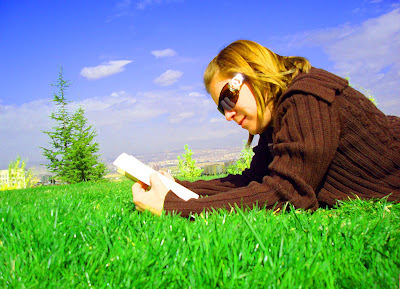 It was nice to just go out walking and read. In a weird way, getting lost kind of helped me to clear my mind. I had to clear out all the mush of the week and just focus on finding a way home. I came out of the hinterlands feeling refreshed and refocused. It's been a wonderful holiday week for us and I hope it's a great weekend for all of you. My entry in this Wednesday's mailbag was a joke. Sarah read it before I posted it, made me change a grammar mistake, and told me to post it because she thought it was funny. We're getting along swimmingly. Sarah said everything I would have said in her response to the mailbag question, so instead of repeating her sentiments, I invented fake ones which were meant to provoke a chuckle. There is no conveniently located pub here, we don't have to ignore each others disgusting and irksome habits, and we're both a little happier each day that we chose to spend the first two years of our marriage abroad. We're both happy and I love my wife very much.